"The razor blade on the front cover of the book is what one yearns for right after embarking on this read, sharp blade with which to cut every single page, one by one, until they are so neatly shredded that even the memory of what was written on them becomes non existent. And then, one can use the same razor to end one's own life. I'm still unsure what the author was thinking when she began this book, unless she had some very deep and very disturbing mental issues to work through. This book is dangerous and not because it excites one with a thrilling and suspenseful story. It is dangerous because once one reads it, one loses any desire to look for another book that may restore one's faith in the existence of good books with an uplifting charge. Not only is this book dangerous, but it is sick. Its underlying sickness is that it's emotionally draining and unless readers are looking to load up on more mental baggage (I can't think of anyone who doesn't have enough), I'd stay away from its pain." Gillian Flynn, for the past few years, has gotten a fair amount of attention for Gone Girl, a stunning novel about a husband and wife -- and how easy it can be for some people to hide their true selves. A lot of people don't realize she has other novels, too. I like crime novels. I have always liked crime novels, suspense stories, horror stories. I read a lot of Stephen King (even though I find his books maddening). Good crime novels are hard to find these days, too often falling into the trap of a singular portrayal (white male cop, period) and specific crimes (drugs, gangs, the mob). I was excited to find Gillian Flynn: she is a woman writing mainstream crime novels with female main characters. I liked Gone Girl. I didn't love it, but I liked it. I was mostly stunned by it; I wanted to absorb Flynn's writing style and talent (a common feeling when I read a book I really like). The twist wasn't much of a twist; I had guessed it mostly from the beginning. This is true of all of Flynn's novels: you're going to know about the twist early on because, well, it's obvious. That seems to be the crux of most amateur reviews: I saw it coming or I wasn't surprised. I liked Gone Girl, but I loved Dark Places, another of Flynn's novels about a girl whose family was famously murdered in a Satanic ritual (or so she thinks, announces the voice over in the theatrical trailer). I loved that the main character, Libby, was as deeply unlikable as Amy from Gone Girl, but for entirely different reasons. She is a lazy, manipulative, kleptomaniac obsessed with being the saddest story, constantly mourning not really her family anymore, but herself. It's a brilliant book. Then I read Sharp Objects. I spent a lot of time thinking about Sharp Objects. It revolves around a journalist named Camille, who returns to her hometown to cover the murder of one preteen girl and the disappearance of another (potentially related). She is still dealing with a lot of personal pain and the return home isn't really what she needed to recover. As the quoted reviews point out, this is a book -- a town, a main character, a family -- that is diseased. It's sick. This is a sour spot for a large number of readers, it seems. If you're someone who doesn't enjoy reading about the twisted psyche of a small town, then this isn't a book for you. Part of me believes that you need to come from a small town to understand the claustrophobia and sickness of a small town like the one in the book. Cottage Grove is a town that mopes like a man. I come from a small town. Cottage Grove, Oregon, to be exact, a town known for having the largest number of covered bridges in a 5 mile radius of town. The Covered Bridge tour is a draw and now, so are the vineyards, all lying about 10-15 miles west of town -- but people have to pass through from I-5 to get to them. The town is not prosperous; with the recession, sawmills and logging operations closed down and left a lot of people poverty-stricken. My mother grew up knowing everyone in town, but now we don't know anybody. I see a lot of dirty kids. A lot of trash in the river. There is a man who walks the streets of our 3-block downtown screaming to himself. Cottage Grove is like so many small towns: dirty, old, obsessed with itself and its false pride, poor. Cottage Grove is like Wind Gap, MO in Sharp Objects: a town with a cruelty that is kept very, very secret. Like most small towns. I think to understand Sharp Objects, you have to understand the claustrophobia and fear of small towns, the way it's so easy for small towns to fall into mass hysteria and panic. If you don't, the novel only seems sick, purposefully painful, writhing in its own sadness. I love the sticky, moist writing, so reminiscent of warm, Midwestern towns in the summer. I love the unconventional main character and I love her personal issues. I love how deeply I identify with them and yet, how deeply I want to understand them because they are so foreign. I love the mother, Adora, because she reminds me of older women I know. I love that it is a book that made me feel uncomfortable, but drew me in. I loved that it was a crime novel that wasn't about a cop. I loved that I know who the killer was (or who I thought the killer was) from the very beginning. I love that the big twist takes place in about 1 page of text. I love that the prose feels dirty, the way it is supposed to, the way it should with such a sick story. 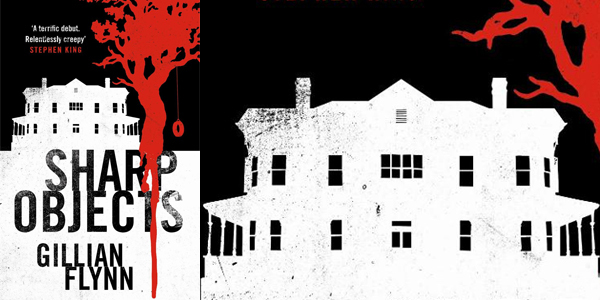 Sharp Objects isn't a book for everybody, but it is a book that should not be dismissed. The writing is beautiful; the story is magnetic. It's a better book than Gone Girl. Don't believe me? Read it for yourself.